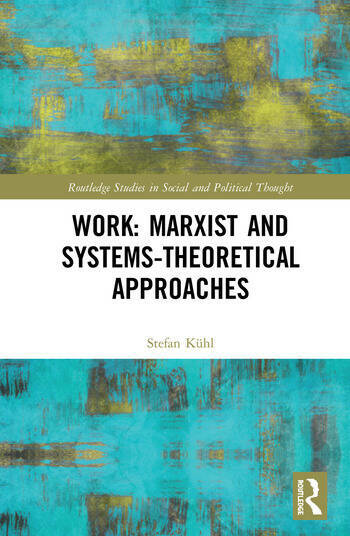 Using Marxist and systems theory as guides, this book offers an entry point to the current debate on the role of economy in modern society, the change in work organizations and the effect of the economy on the individual. It explores the concepts of ‘work society’, ‘industrial society’ and ‘capitalist society’ to explain the conditions of society as a whole, and not just the conditions of businesses, making particular use of the category of ‘work’. The first systematic theoretical comparison of Marxism and systems theory, it provides a brief overview of the central debates concerning work society and the controversies surrounding organizations in capitalism. As such, it will appeal to social scientists and social theorists with interests in the sociology of work, industry and organizations. Stefan Kühl is Professor of Sociology at the University of Bielefeld, Germany and a senior consultant for Metaplan — a consulting firm based in Princeton, Versailles, Hamburg, Shanghai and Singapore. He is the author of Organizations: A Systems Approach; When the Monkeys Run the Zoo: The Pitfalls of Flat Hierarchies; The Sudoku Effect: Universities in the Vicious Circle of Bureaucracy; The Nazi Connection: Eugenics, American Racism, and German National Socialism; For the Betterment of the Race: The Rise and Fall of the International Movement for Eugenics and Racial Hygiene; and Ordinary Organizations: Why Normal Men Carried Out the Holocaust.